Listed in this section are the names of the succulents shown above. 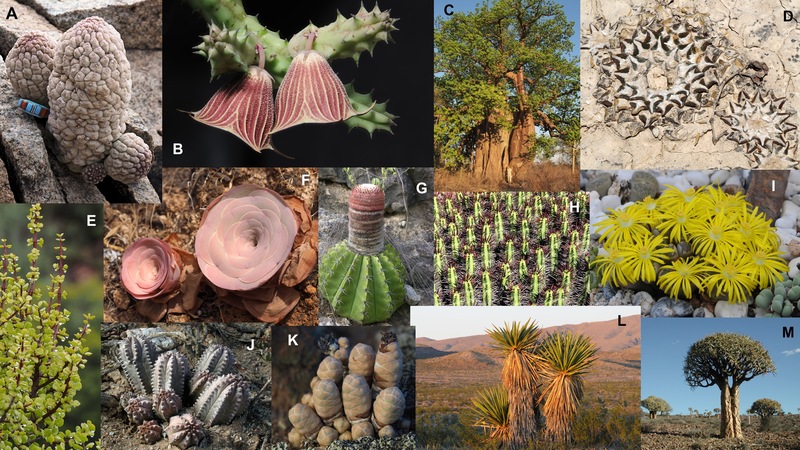 Also mentioned are the plant families they belong to and the location where they were photographed. A. Larryleachia sp. (family Apocynaceae, South Africa), B. Huernia keniensis (family Apocynaceae greenhouse photo), C. the very large African baobab, Adansonia digitata (family Malvaceae, Botswana), D. Ariocarpus kotschubeyanus (family Cactaceae, Mexico). E. Portulacaria afra(family Portulacaceae, South Africa), F. Greenovia alba (family Crassulaceae, Canary Islands, Spain), G. Melocactus bellavistensis (Cactaceae, Peru), H. Euphorbia enopla (family Euphorbiaceae, South Africa, I. Lithops sp. (family Aizoaceae, South Africa), J. Euphorbia pseudoglobosa( family Euphorbiaceae, South Africa), K. Crassula barklyi (Crassulaceae, South Africa), L. Yucca faxoniana (family Asparagaceae, Big Bend National Park, Texas USA), M. Aloe dichotoma (family Asphodelaceae, South Africa). Most photos were taken by Michael Douglas, a few were taken by Rosario Douglas. The thirteen succulents pictured above represent six countries (South Africa, USA, Mexico, Peru, and Spain), two continents (Africa and the Americas) and nine plant families (Apocynaceae, Malvaceae, Cactaceae, Portulacaceae, Euphorbiaceae, Aizoaceae, Crassulaceae, Asparagaceae and Asphodelaceae). This collage highlights the fact that there are thousands of succulent plants distributed in about 25 plant families. These families are found in the Americas, Europe, Africa including Madagascar, Australia and Asia. Succulents can live in very dry areas or in rain forests, some can tolerate freezing while others are restricted to areas with warmer winters. Evident from the very modest selection shown above is the tremendous variety of succulent plant sizes, shapes, flowers and plant environments. This section aims to educate the reader about the wide variety of succulents found in different parts of the world.